Maple Tree (Acer spp. ): growing, planting, caring. Maples are ornamental trees not be missed in the natural garden, but loved for their shimmering colors in the autumn! Scientific name : Acer spp. Maple trees are a very diverse type of tree, native to the northern hemisphere - from the small Japanese maple trees to very large ones, like sycamores. Maples are distinguished by opposite leaf arrangement : the leaves in most species are palmate veined and lobed, with 3 to 9 (rarely to 13) veins each leading to a lobe, one of which is central or apical. A small number of species differ in having palmate compound, pinnate compound, pinnate veined or unlobed leaves. Some species of maple are extensively planted as ornamental trees for their incredible fall colour, relatively fast growth, and ease of transplanting. 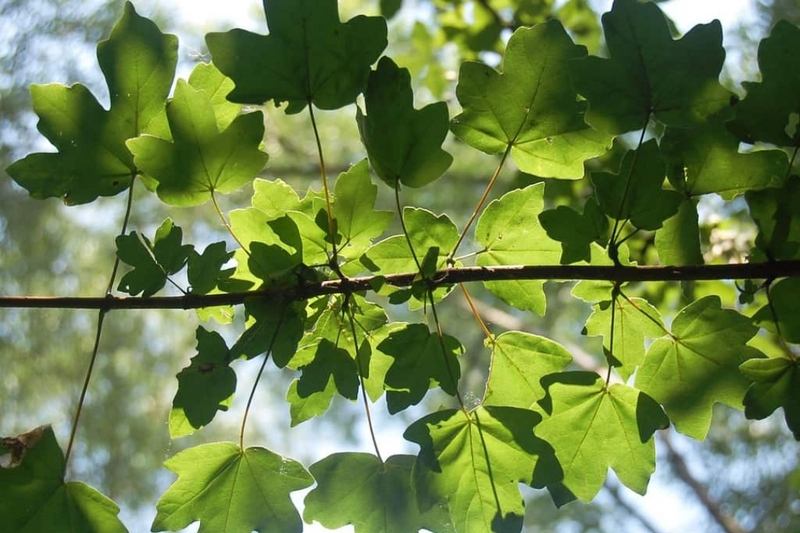 One of the clues to recognize maples all the time is that they have opposite leaves, often webbed. Flowering takes place in the spring, it is yellow-green, in panicle or in clusters. The maples form samaras in autumn, winged seeds grouped in pairs, which resemble small propellers. Maple leaves often become very bright in the fall. Plant your maple in a neutral or slightly acidic soil, cool or wet, in the sun, away from the drying wind. Most ornamental maples do not withstand heavy frosts. Respect at least six meters near a facade, and 10-12 meters from another tree. Dig a planting hole twice the volume of the rootball, unpack the edges of the hole, plant a stake at the bottom, facing the prevailing winds. Fill first with the bottom soil, put the root ball in and adjust the level, and put back the top soil. Attach the trunk to the stake with a suitable flexible link. Tamp, form a hollow for watering, water copiously. In pots, place a draining layer of non-calcareous gravel or any other coarse aggregate, then place the clod in a mix of loam and decomposed compost. Cover with a mulch of bark. In winter, frost period, cut dead branches and those that crosses each other. Remember to remove the stake two years after planting, it causes more problems than it solves at this stage. Maple trees multiply easily by sowing. Collect seeds in the fall, and keep them outside in a container filled with sand. This is called stratification, the cold unlocks the seeds' ability to germinate. Sow in pots or directly in place during spring, then cover with some earth mixed with sand. The common diseases in maple trees are: galls formed on leaves by mites, which are not serious, just like black spots. On the other hand, if you see blackening twigs and dry leaves, cut the entire branch lower than the damaged part. It is a fairly serious fungal disease, so burn the twig and disinfect your tools.